The High Definition Space Telescope is a proposed space telescope that would be five times as big and 100 times as sensitive as the Hubble, with a mirror nearly 40 feet in diameter, and would orbit the sun about a million miles from Earth. The revolutionary HDST space-based observatory would have the capability to find and study dozens of Earth-like worlds in detail. Some simulated images show how it would resolve a solar system like ours 45 light years away. 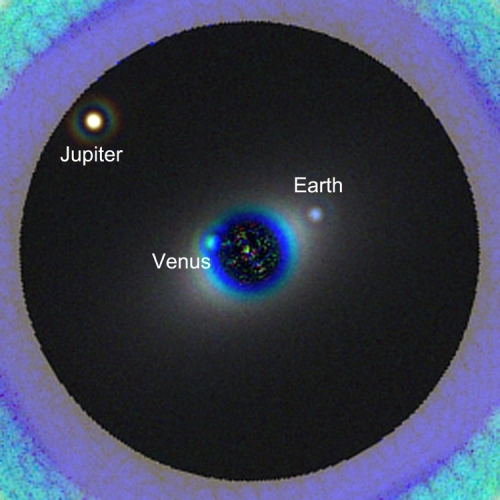 A simulated image of a solar system twin as seen with the proposed High Definition Space Telescope (HDST). The star and its planetary system are shown as they would be seen from a distance of 45 light years. The image here shows the expected data that HDST would produce in a 40-hour exposure in three filters (blue, green, and red). Three planets in this simulated twin solar system – Venus, Earth, and Jupiter – are readily detected. The Earth’s blue color is clearly detected. The color of Venus is distorted slightly because the planet is not seen in the reddest image. The image is based on a state-of-the-art design for a high-performance coronagraph (that blocks out starlight) that is compatible for use with a segmented aperture space telescope. Credit: L. Pueyo, M. N’Diaye (STScI). It would likely cost about $8 to 10 billion. The James Webb Space Telescope (JWST), previously known as Next Generation Space Telescope (NGST), is a major space observatory under construction and scheduled to launch in October 2018. The JWST will offer unprecedented resolution and sensitivity from long-wavelength (orange-red) visible light, through near-infrared to the mid-infrared (0.6 to 27 micrometers), and is a successor instrument to the Hubble Space Telescope and the Spitzer Space Telescope. 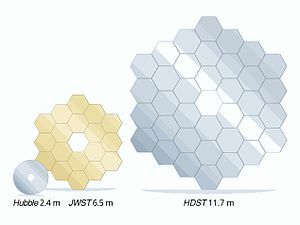 While Hubble has a 2.4-meter (7.9 ft) mirror, the JWST features a larger and segmented 6.5-meter (21 ft) diameter primary mirror and will be located near the Earth–Sun L2 point. A large sunshield will keep its mirror and four science instruments below 50 K (−220 °C; −370 °F). The high definition space telescope is diffraction limited at 500nm, right in the middle of the visible spectrum. Diffraction limit is effectively the wavelength that any circular mirror gives its best angular resolution, the ability to discern detail. Angular resolution is governed by the equation λ (lambda) or wavelength expressed as a fraction of a meter / telescope aperture (D) expressed in metres; e.g HDST has its optimum functioning or “diffraction limit” at 500nm wavelength, defined by the equation 500nm (10-9)/12m. The higher the aperture of a telescope the more detail it can see at any given wavelength and conversely the longer the wavelength, the less detail it can see. That is under perfect conditions experienced in space as opposed to the constantly moving atmosphere for ground-based scopes that will rarely approach the diffraction limit. So the HDST will not have the same degree of resolution at infrared wavelengths as visible wavelengths, which is relevant as several potential biosignatures will appear on spectra at longer wavelengths. Approaching the diffraction limit is possible on the ground with the use of laser-produced guide stars and modern “deformable mirrors or “adaptive optics,” which help compensate. This technique of deformable primary and especially secondary mirrors will be important in space as well, in order to achieve the incredible stability required for any telescope observing distant and dim exoplanets. This is especially true of coronagraphs, though much less so with star-shades, which could be important in determining which starlight suppression technique to employ. A large 12m HDST would require a WFE of about 1/20 lambda and possibly even lower, which works out to less than 30nm. The telescope would also require a huge giga-pixel array of sensors to capture any exoplanet detail, electron-magnifying CCDs, Electron Multiplying CCDs (EMCCDs), or their Mercury Cadmium Tellurium-based near infrared equivalent, which would need passive cooling to prevent heat generated from the sensors themselves producing “dark current,” creating a false digital image and background “noise”. Such arrays already exist in space telescopes like the ESA Gaia, and producing larger versions would be one of the easier design requirements. For a UltraViolet-Optical-InfraRed (UVOIR) telescope an operating temperature of about -100 C would suffice (for the sensors, while only the telescope itself would be near room temperature). simulated spiral galaxy as viewed by Hubble, and the proposed High Definition Space Telescope (HDST) at a lookback time of approximately 10 billion years (z = 2) The renderings show a one-hour observation for each space observatory. 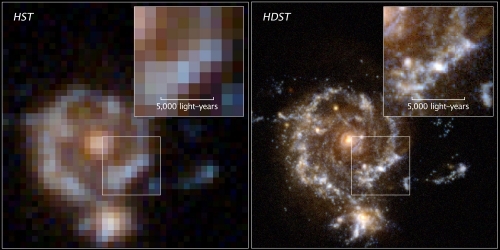 Hubble detects the bulge and disk, but only the high image quality of HDST resolves the galaxy’s star-forming regions and its dwarf satellite. The zoom shows the inner disk region, where only HDST can resolve the star-forming regions and separate them from the redder, more distributed old stellar population. Credit: D. Ceverino, C. Moody, and G. Snyder, and Z. Levay (STScI).